That it is a clean food of the Mediterranean diet. With a low salt content, its fat content don't contain "bad" cholesterol. In addition to an excellent flavor and a subtle aroma, it brings vitamins B1 and B6, it is rich in proteins and it promotes the proper functioning of the nervous system and the brain. Regarding diet, we must know that 100 gr. of pata negra ham only contribute 185 calories and it is rich in oleic acid which serves to combat cardio vascular diseases. 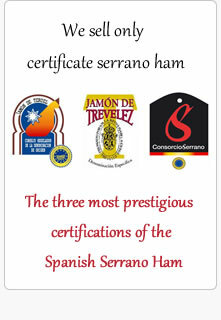 At present, the most consumed and commercialized hams are Bellota and Cebo. 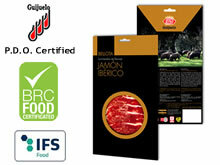 And the most exclusive and expensive, but also the best quality and flavor, are 100% Ibérico Bellota. 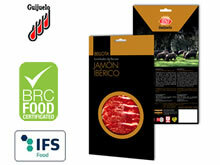 1.- 100% Ibérico Bellota. Purebred certified. 2.- 75% and 50% Ibérico Bellota. Is not purebred. 3.- Cebo de Campo. Is not purebred. 4.- Cebo. Is not purebred. There are four Denominations of Origin (D.O.) in the sector of Pata Negra that guarantees the quality of its hams: Guijuelo, Dehesa de Extremadura, Valle de Los Pedroches y Jabugo. The Serrano Ham Store guarantees that all Pata Negra products included in our catalog complies with all quality and health standards, thus allowing us to offer you the highest quality products. If you live in France, you can place your order in our store Le Pata Negra Paris. - Address: 6 Cerquillas, 28411 Moralzarzal - Madrid. 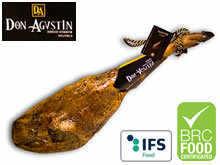 Iberian Pata Negra Ham 100% Pure Bellota Summum Guijuelo. 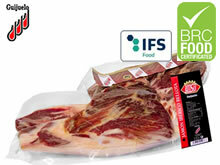 Quality: 100% Ibérico Bellota. 8.5 Kg - £56.55/kg. Bellota Iberian Pata Negra Ham from Guijuelo. Quality: Bellota. 8.0 Kg - £45.70/kg. Iberian Pata Negra Ham from Guijuelo. Quality: Cebo de Campo (medium quality). 7.5 Kg - £31.90/kg. 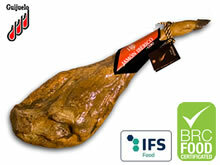 Boneless Iberian Pata Negra Ham 100% Pure Bellota Summum Guijuelo. 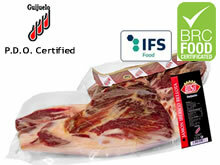 Quality: 100% Ibérico Bellota. 4.5 Kg - £105.50/kg. Boneless Bellota Iberian Pata Negra Ham from Guijuelo. Quality: Bellota. 4.0 Kg - £86.90/kg. Boneless Iberian Pata Negra Ham from Guijuelo. Quality: Cebo de Campo (medium quality). 3.5 Kg - £60.30/kg. 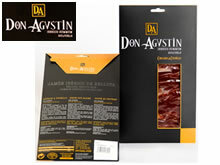 Sliced Iberian Pata Negra Ham 100% Pure Bellota Summum Guijuelo. 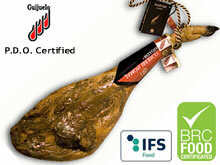 Quality: 100% Ibérico Bellota. 5 packs of 100 gr each. 0.5 Kg - £145.20/kg. Sliced Bellota Iberian Pata Negra Ham from Guijuelo. Quality: Bellota. 5 packs of 100 gr each. 0.5 Kg - £129.80/kg. Sliced Iberian Pata Negra Ham from Guijuelo. Quality: Cebo de Campo (medium quality). 5 packs of 100 gr each. 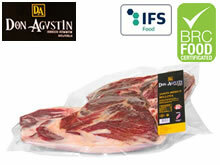 0.5 Kg - £116.00/kg. 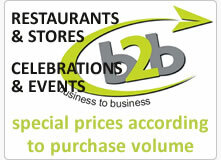 All products from the highest quality at the best price. 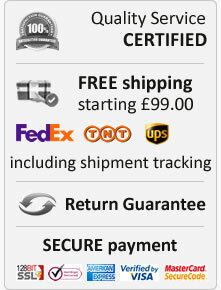 Check out our quality guarantee and returns policy of each of our products.